The busted rear axle bearing was a simple fix; buy a new HK2016 needle roller bearing, and press-fit it into the axle bracket. In fact this happened so quickly I completely forgot to take a picture of the process. I did notice that this new HK2016 bearing had a metal bearing cage rather than the plastic one of my first bearing. Hopefully this would prove to be a little more robust. 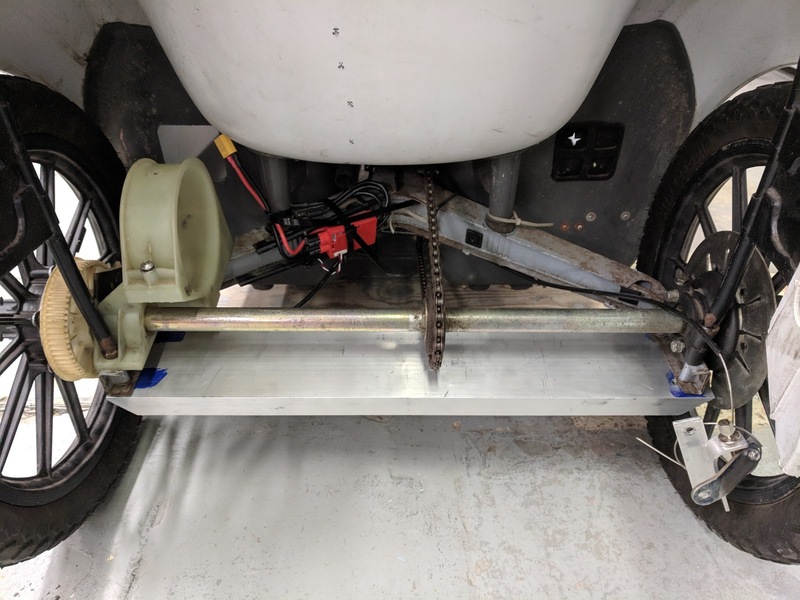 As I didn't have access to a welder at Makespace I'd have to bolt a brace across the rear or the Sinclair C5 chassis to make up for the broken spot welds and to avoid breaking the spot welds on the other side. This was an aluminium tube 4" by 1" and approximately 600mm long. I fitted it between the two straight sections at the back of the chassis, directly underneath the axle. I of course measured twice, cut once, and found it didn't quite fit so the holes were turned into slots. And now it's a feature! Being a nice rigid box, it would stiffen up the rear of the chassis nicely and not add too much weight. It would also add a bit of protection should the wheels fail catastrophically as well as a wealth of mounting points. 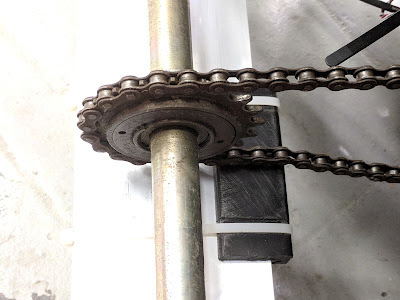 Unfortunately due to it's position it slightly interferes with the pedal chain so to avoid carving a hole in the aluminium tube with the steel chain I added a block of HDPE that was quickly shaped on Makespace's bandsaw and zip-tied in place. It helps to both protect the aluminium as well as guide the chain round the rear cog. However in the process of mounting the aluminium tube I was fiddling with the rear drum brakes and managed to snap them. From the way it had snapped I was quite happy I'd broken it while it was in Makespace, if it had happened at speed bad things could have happened. But it was still broken and considering my C5 was quite fast after the gearbox upgrade, I'd really like to stop when I wanted it to. 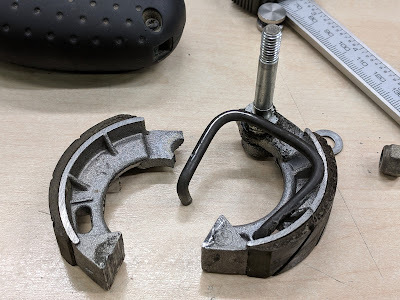 I tried searching for a replacement, initially finding a Sturmey Archer drum brake for bicycles that looks like it would fit. But unfortunately it was for 70mm diameter drums, the Sinclair C5 brake is for a 2.5" drum, or 63mm for the less imperially minded. Very luckily I'd recently joined the Sinclair C5 Owners page on Facebook and found someone who could sell me a replacement. After a very pleasant transaction with a guy called Marc I was the owner of a new drum brake and fitted it the second it arrived. 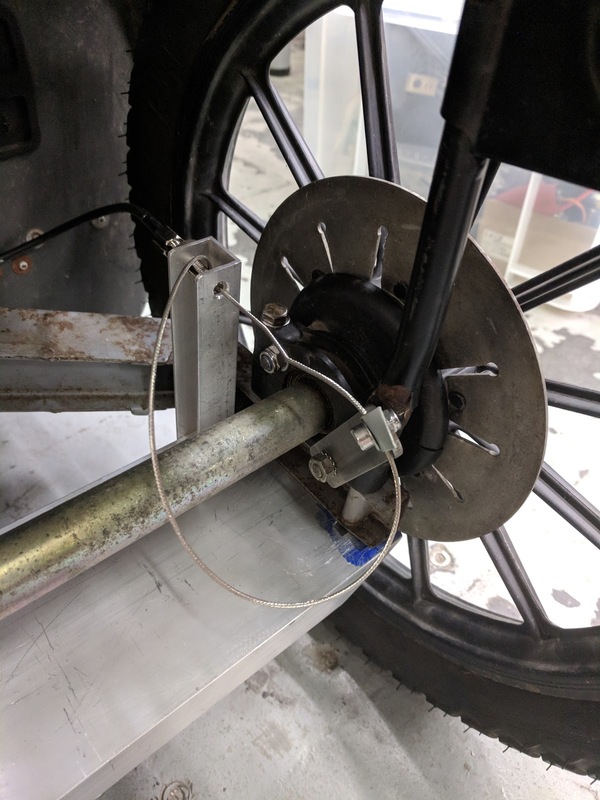 The final remaining task is to reconnect the brake cable. When I added the rectangular aluminium tube brace it interfered with the usual placement of the drum brake lever. I think I've found a way to get it reconnected and working but I do actually need to fit it. Looking around on the internet were a few examples of people who had screwed disk brakes to their drum brake wheels and made an aluminium disk brake caliper mount out of aluminum bolted to their C5 chassis. Now while this would be a a vast improvement I didn't want to damage the original parts so I'll add disk brakes to a future set of upgrades involving a new chassis and wheels. The pillar allows me to mount the rear drum brake cable so it pulls the lever that actuates the drum brake. 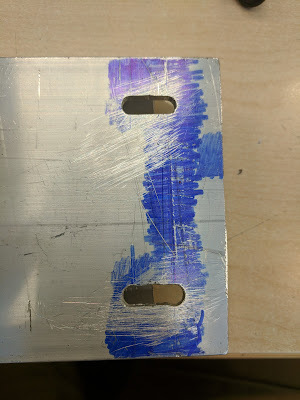 It's a small bit of aluminium channel I found at Cambridge Makespace and then attached with 2 pop-rivets. It's not super robust but it held up well to my attempts to break it. A quick cycle round Makespace to prove it worked and then onto the next task. In the previous post I mentioned I'd managed to get a load of working eBike batteries for a bargain. 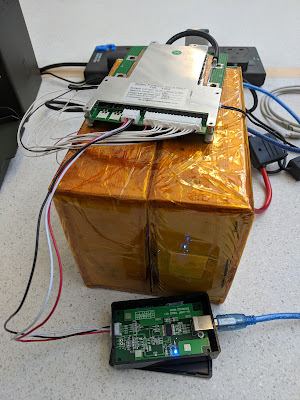 Unfortunately the largest batteries wouldn't fit in the Sinclair C5, they were too long and interfered with the pedals. However I figured that by dismantling them and re-arranging the cell packs I could get them into a more suitable format for a Sinclair C5. 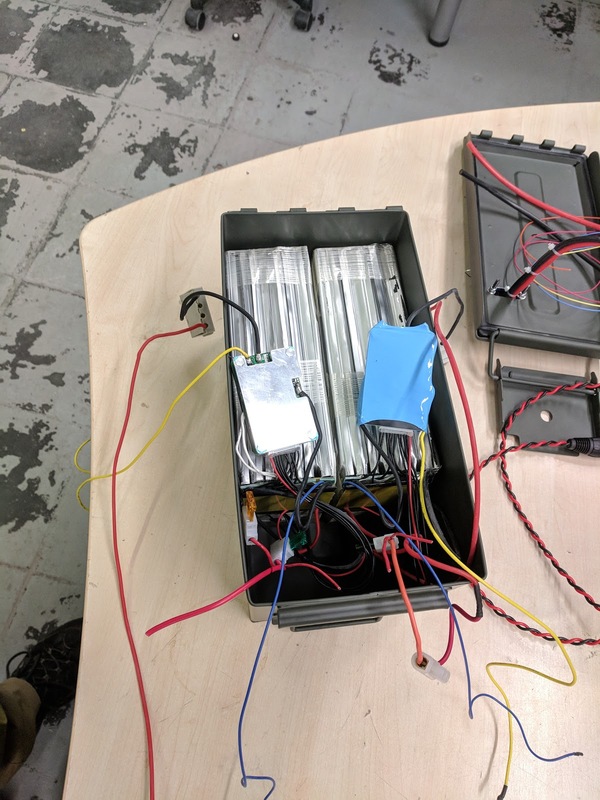 In that .50 cal ammo box there are 2x 10s, 36V 16Amp hour batteries arranged so I have a single 32 Amp hour pack. I'm using an ammo box because it was a quarter of the price of a suitable outdoors rated plastic box. In addition as it's metal it'll handle accidental impacts much better and should bad things happen, it'll contain the fire much more effectively. I've been jokingly saying "if seat warmer engages, exit the vehicle and run!" but that really is the procedure. 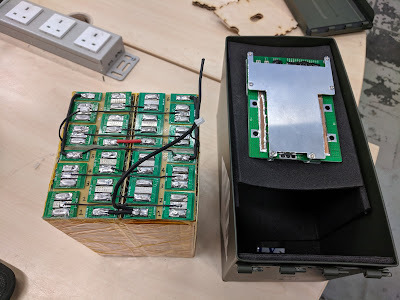 The above picture shows the combined battery packs with all the extra wiring removed and I'm just checking that the BMS will actually fit in the ammo box. I was planning to solder on the automotive in line Maxi Blade Fuse holder as well as thicken up the negative wire, in the above picture it's 14-12AWG which is too light. 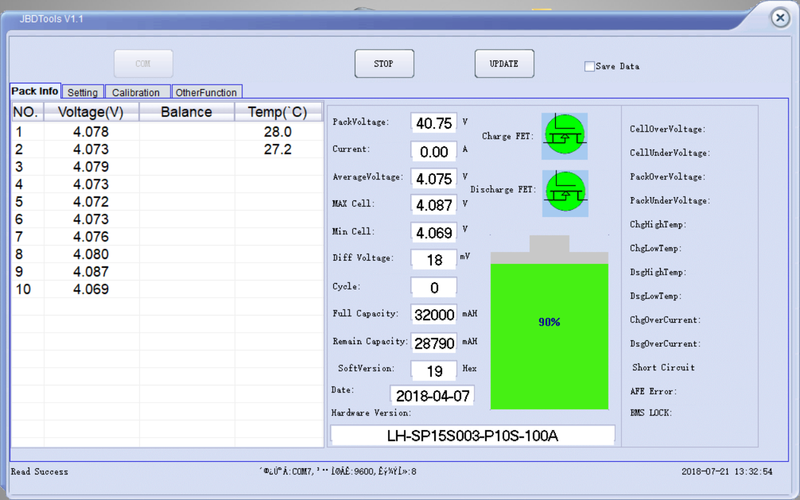 I've also added the balance wires that let the BMS check how individual cells are getting on. 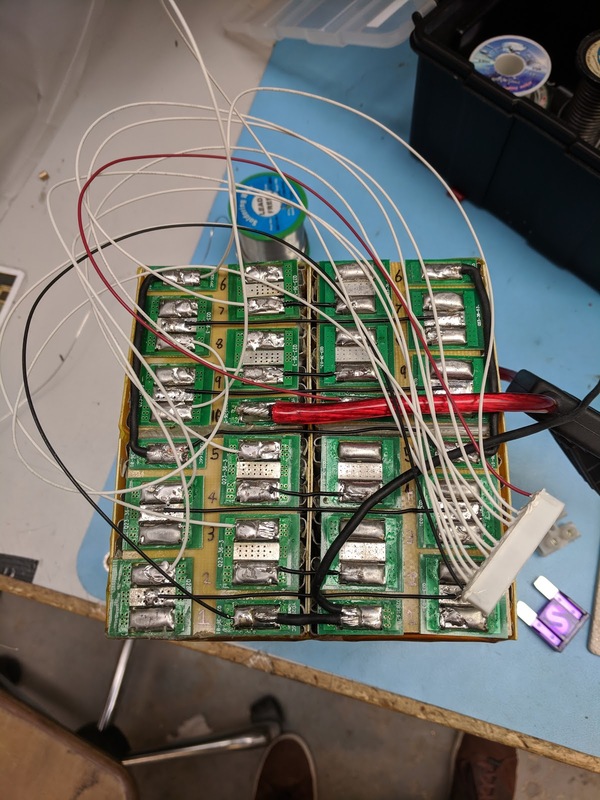 The purple thing to the bottom right is the 100A Maxi Fuse, while the BMS should disconnect when it sees too much current flowing the fuse acts as a fail safe. 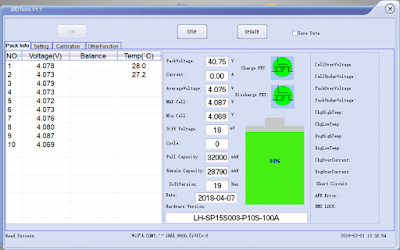 The main attraction of this BMS was the USB/Bluetooth data link. It appeared to be some sort of serial link and I'm planning to use a Raspberry Pi as a display module to show this data in real time. I should be able to get the battery status, discharging and charging rates on a small 2.4" LCD for when I'm driving along. With the Battery box functionally complete and the rear brake fixed I figured it was time for some test driving in Cambridge, UK. I went to meetup with some friends and ate sushi outside Kings College while relaxing in my Sinclair C5. I got quite a few interested people asking me questions which was quite nice. I took it for quite a few drives as well as another high speed run however my top speed didn't really improve much, only managed to increase it to 28 mph. 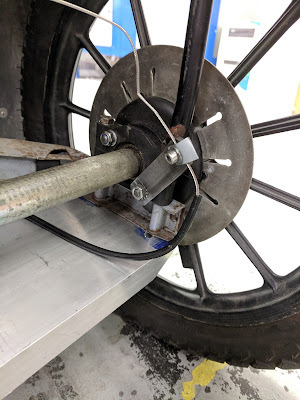 I think this may have been due to the brakes not quite being tuned correctly and the subsequent friction stopping me from hitting the goal of 30mph. 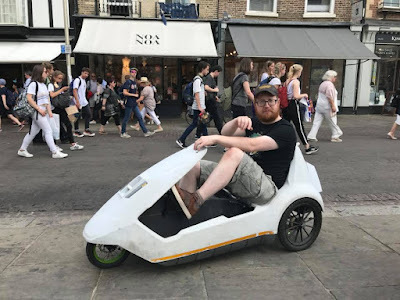 But the main thing is that the Sinclair C5 is in a good place for EMF Camp at the end of August, in fact I may also make the inaugural Hacky Racers event, The Scrumpy Cup! Oh yes, but I really don't want to bodge it on the original wheels, but due to the funny axle (1/2") and small diameter wheel (16") it's proving impossible to find a suitable donor wheel. I do need to find a willing camera person or a selfie stick!